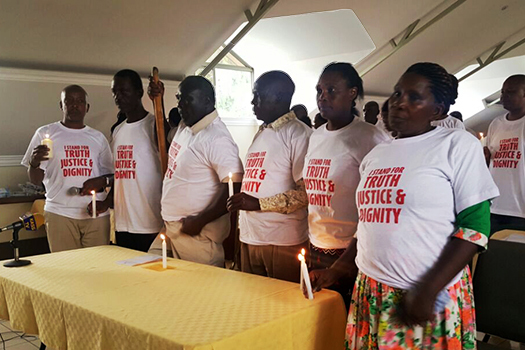 On March 24th, Kenyan state agencies, survivors, civil society organizations, and international partners will join together in Nairobi to observe the International Day for the Right to the Truth. It is an opportunity for Kenyans to honor victims of human right violations and those who have championed their fellow citizens’ right to the truth. The event also aims to generate dialogue between the government and victims about how reparations to victims of past gross human rights violations will issue from the Restorative Justice Fund– as well as how to implement key aspects of the final report issued by Kenya’s Truth, Justice and Reconciliation Commission (TJRC) in 2015. The right to the truth carries special resonance in Kenya, where numerous commissions of inquiry have been created to investigate the causes, patterns, and impacts of gross human rights violations committed in the country since Independence—and before. The most significant inquiry into the truth was the TJRC: from August 2008 until May 2013, over 40,000 victims from across the country recorded statements with the commission. Witnesses testified to abuses ranging from massacres, enforced disappearances, and sexual violence to economic marginalization and corruption. The TJRC issued a final report, establishing that these violations were perpetuated in the context of state security operations, and that they caused ongoing and devastating effects. The TJRC Report called on the state to put in place several measures meant to provide redress for victims and to prevent recurrence of gross human rights violations. It recommended that the President, the Chief Justice and the Inspector General of Police to acknowledge and offer apologies for violations committed by state agencies. It urged the establishment of public memorials in honor of victims and affected communities. It presented the need for further investigations and prosecution of individuals alleged to have been involved in the perpetuation of human rights abuses. And it called on reparations to affected individuals and communities. These recommendations underscored an important fact: the right to the truth, while inalienable and independent, is not an end unto itself. It is a right that is intended to empower victims as they seek redress, recognition, acknowledgement, and closure for the abuses they endured. However, while the TJRC’s report was presented to the National Assembly in 2013 for adoption and implementation, the body has yet to adopt the report despite calls from President Uhuru Kenyatta and a petition by the National Victims and Survivors Network (NVSN). In its review before the UN Human Rights Council in 2015, Kenya pledged to implement the TJRC’s recommendations and provide reparations to victims and survivors, a pledge that remains unfulfilled. Victims also await the distribution the KShs. 10 billion fund ($110m USD) Restorative Justice Fund promised by President Uhuru Kenyatta during his State of the Nation Address in March 2015. As we observe International Right to Truth Day, the state’s delay in adopting and implementing the TJRC’s findings and recommendations remains a cause for concern among victims, their families, their communities, and our nation at large. The prolonged history of gross human rights violations and the state’s failure to provide redress has resulted in persistent divisions among Kenyans on ethnic, regional, political, and economic lines, and led to a lack of public trust in political and governance institutions. The continued failure to adopt the TJRC’s report denies the country the opportunity to understand and address root causes of historical injustices and gross human rights violations, leaving Kenyan society susceptible to continued cycles of violence and gross human rights violations. This year’s commemoration of International Right to Truth Day seeks to open dialogue on these issues. In addition to commemorating and dignifying victims and human rights defenders, the event will create a forum in which the government and civil society representatives can discuss progress and proposed timelines for the implementation of the Restorative Justice Fund. We are proud that representatives from the NVSN will be joined in these discussion by Hon. Githu Muigai, the Attorney General; Kagweria Mbogori the Chair of the Kenyan National Commission on Human Rights (KNCHR); and Marcella Favretto, Senior Human Rights Advisor Office of the High Commissioner for Human Rights (OHCHR). The discussions will include the adoption and implementation of regulations to guide the distribution of the fund, regulations that have been developed through collaboration between the Office of the Attorney General, KNCHR, ICTJ, civil society partners (through the Kenya Transitional Justice Network) and victim representatives (through the NVSN). The meeting also presents all parties with an opportunity to chart a path towards the implementation of key aspects of the TJRC Report. We urge the government of Kenya to demonstrate a much deeper commitment and goodwill to implementing the Restorative Justice Fund by putting in place a reparations program that acknowledges the violations of victims of gross human rights violations, that dignifies them and that ensures that there will no repetition of violations of their rights. Currently the TJRC Report remains stuck in the National Assembly and as result the National Assembly is viewed as the stumbling block to addressing historical injustices in Kenya. We therefore also urge the National Assembly to take cognizance of the TJRC Report and the fact that it contains the aspirations of thousands of victims and put in place necessary measures to enable its implementation.